The 'Shaadi by Marriot' brunch is all that you need to have on 2018 wedding menu! Courtyard By Marriott, Mumbai hosted a Shaadi brunch which I recently attended and I am still getting over on how spectacular it was! Right from the theme, the decor, the variety in food to the table setting - it was just ‘perfect’! The idea the Shaadi brunch was to create a wedding setting which is inclusive of the right ambience, fingerlicious shaadi-worthy food and wonderful hospitality. I was awestruck to see that the skilled, talented and professional team at Courtyard by Marriott nailed it, right to the minutest detail. As the theme was Indian Shaadis, the decor totally justified it. I walked into their lobby which had this very vibrant but totally classy decor giving me some major #ShaadiVibes and elegant lighting with crystal details giving the modern touch to it at the same time. All of it was done to perfection, with the right combination of colours, crystals and quirky elements. Now, let’s talk about my favourite part - food! The menu was done primarily according to Indian taste buds, but they also had a number of continental dishes which were just amazing and that’s where I started from. Sea salt baked kingfish, barbecue roast chicken, mushroom ragout creamy polenta roma and lemme tell you it was as yummyyy as it sounds! In addition to such mainstream continental dishes there was also a variety of Italian cuisine that was available. Near to that, there was Khow Suey too, and it was mind blowingly delicious! When I say delicious I mean it was the perfect blend of coconut and the spices. There was a DIY pasta and salad station as well, which is perfect for a wedding because you get to put in the things you like and do away with the things you don’t. The buffet also hosted a wide range of Indian starters, curries, breads and more. There was also a chat counter, and if you ask me it’s something that a desi wedding cannot do away with! Dal Baati Churma, Gatte ki sabzi, aam and papad ki sabzi were my absolute favourites amongst all. It takes something to be a bombay-walla and like misal-pav everywhere, but this one was made so good. The bun was crisp and fresh while the missal was not-too spicy to throw you off and not too bland either. There were other delicacies like Kombdi vade too, but this just stole my heart. There were 8 varieties of dosas with a huge live-counter catering to all the guests. I happened to have this paneer-masala one and it was the right amount of crisp, buttery, spicy and totally mouth watering. I happened to have these prawns delicies and I am running out of words here to describe how amazing they just were. Also, I finished it in 10 minutes, given the fact I had all of the above too! Yes, I was saving all the space in my tummy for this only. The dessert counter was well-stocked with a vast variety. 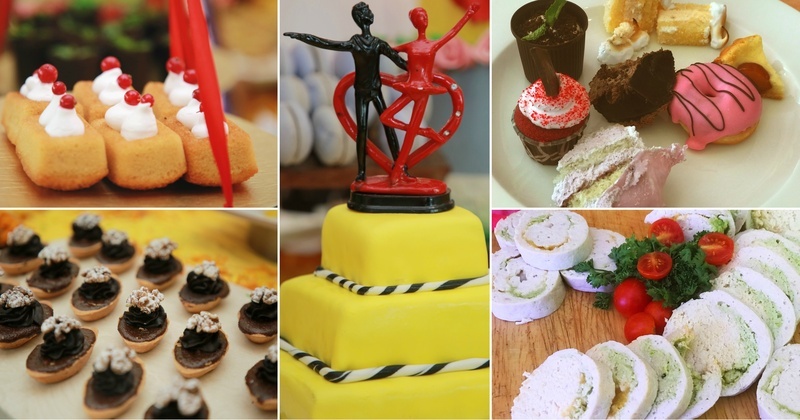 It included Indian sweets like laddoos, halwas and jalebis, handmade chocolates, pastries, toffees, cookies and of course, multiple wedding cakes. That strawberry coated doughnut (I had 4 of it more), mud-pot-cake (the container was edible too) and that red-velvet cupcake were absolute amaze! Be rest assured that you will go in total food coma from these! Let’s talk decor. I already said it was done very tastefully, but hanging desserts? That really caught my attention! Also, a macaron tree? I really found it hard to make my way out of this dessert wonderland! I ended the brunch wishing I could magically fit more food into my body, because each bite was simply fingerlicious!